Among Those Planning To Spend – Livability Is Tops! 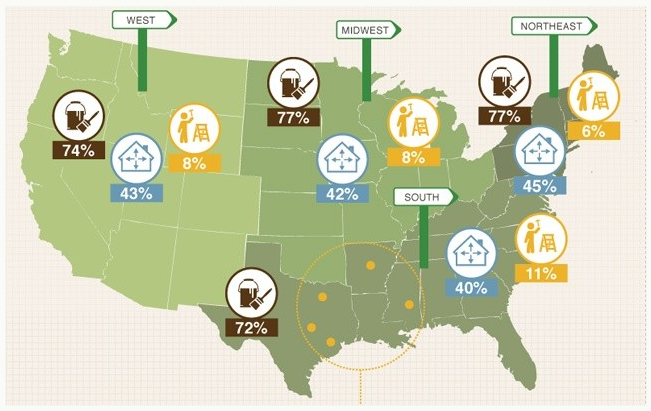 In a February 2012 survey, published recently on Houzz.com, homeowners that are looking to spend money on home improvement in the next two years are overwhelmingly focused on livability over resale value. Great news for the remodeling market, as more homeowners choose to stay put and improve upon their existing homes. Even as new and existing home sales and prices climb, homeowners are prioritizing aesthetics before profit, according to the February 2012 Houzz & Home Survey conducted among users of the Houzz app and website. Results are based on 29,127 respondents (87 percent homeowners, 13 percent renters). The gap between these priorities was consistent across all income levels and demographic groups. Of today’s homeowners, 70 percent do not plan to take out a loan to pay for that beautiful home. They’d rather cut back on vacations and other big-ticket items or do some of the work themselves than delay or decrease the budget for their home improvement plans. Even upscale homeowners are taking a hands-on approach to building, remodeling and decorating projects. The survey found that while 45 percent of households at upper income levels ($150,000 per year or more) are choosing to hire an architect, an interior designer, a general contractor or another remodeling or decorating professional to complete a project in its entirety, an equal number of them are combining professional help and DIY efforts. That proportion is only slightly less than the 49 percent taking this combination approach in lower income brackets. Find a professional! Ask if they're a "PRO"
When planning your home remodel, choose to hire a professional for getting the job done right. Home owners can save time, aggravation, and money by hiring a professional remodeler. And the best place to find a professional is to hire a member of the Professional Remodelers Organization (PRO) of the Home Builders Association of Metropolitan Portland. 1. Technical training and experience in home remodeling. These remodelers have years of technical training and experience that cannot be equaled by do-it-yourself books or television programs. They understand a home’s structure, electrical wiring, plumbing and other details that must be considered before attempting a home remodel. Inexperience and ignorance can create costly mistakes, but professional remodelers can prevent disasters and solve unexpected problems. 2. Ability to creatively address budget and space constraints. Most remodelers relish the chance to employ new design solutions to reorganize and maximize space in a home. This ability to work with a home owner on their remodeling dreams within a budget is a specialty of many remodelers. They can help propose alternatives that keep the budget in check, such as providing a variety of product choices or redesigning interior space to minimize the need for building home additions. 3. Information on tax credits and other ways to save money. Remodelers can help you cash in on energy efficiency tax credits for saving on remodeling expenses. These credits offer money back on installing energy efficiency improvements such as new windows, doors, insulation, roofing, and more (see http://www.nahb.org/efficiencytaxcredit for more information). Remodelers may also know of additional local or state credits, rebates, and other methods of saving money on your home remodel. 4. Commitment to excellent customer service. A professional remodeler has solid business skills and understands that remodeling is about providing excellent customer service. These remodelers will take meetings and return phone calls to address customer concerns proactively. They prioritize customer satisfaction and take pride in their remodeling work. 5. Professional references and work samples. Professional remodelers are more likely to belong to trade associations (such as the National Association of Home Builders) where they benefit from education programs, acquiring knowledge and skills to better run a business and improve their home remodeling services. A remodeler in good standing can also provide references from past clients. They also can show examples of previous remodeling projects to give you a feel of the quality and style of their work. For more tips on planning a home remodel or hiring a professional remodeler, visit http://www.nahb.org/remodel or contact the Professional Remodelers Organization (PRO) at 503-684-1880. LEAD legislation needs your support! On March 1, 2012 Senator James Inhofe (R-OK) introduced S. 2148, the Lead Exposure Reduction Amendments Act of 2012. This piece of legislation improves the Lead: Renovation, Repair, and Painting rule (RRP) which has hampered the home building industry with burdensome compliance costs. The Environment Protection Agency (EPA) finalized the RRP rule establishing new requirements for contractors and remodelers working in homes built before 1978. The rule prescribes a series of work practices and contractor certification requirements as a way to address impacts associated with the disturbance of lead-painted surfaces in older housing. Specifically designed to address potential lead exposures to children under six years of age and pregnant women, the RRP rule requires contractors and remodelers working in older homes to obtain certification from the EPA. This legislation will restore the “Opt-Out Provision” from the RRP rule which allowed homeowners without children under six or pregnant women residing in the home to allow their contractor to forego the use of lead-safe work practices. By restoring the “opt-out provision”, it will eliminate unnecessary regulations and compliance costs estimated at $508 million a year. Urge your Senators to support this legislation here. The Home Builders Association of Metropolitan Portland’s Political Action Committee recently voted to oppose a measure on this year’s ballot that would put Oregon homeowners at risk. Measure 63 would allow homeowners to perform up to $35,000 in remodeling in a single calendar year without a permit. Heiteen said Measure 63 would create an enormous liability risk for homeowners, because it makes the homeowner directly responsible for all changes they make during renovation. Even if the home was sold, any future problems connected to the remodeling work would be the responsibility of the owner who commissioned the work. Worse, the measure would present health and safety risks from problems like electrical fires, burst plumbing, or even structural collapse. Other home builders associations around the state are anticipated to join in opposing the measure as the election nears. To learn more about Oregon Ballot Measure 63 see previous post.